Achieving the goal of sustainable development and taking social responsibility are the commitments that Tatung Co. takes in since 1918. In the light of financial tsunami in recent period, we have committed ourselves to seek stable growth. Global warming and climate change has become two topics that mostly concerned around the world. The society, government, customers all expect companies to conserve the energies and cut off greenhouse gas emission. We started to work out greenhouse gas emission inventory within the factories and subsidiaries since 2009. As the more information we have gathered in hands, the clearer we know where we can reduce the greenhouse emission. We also focus on expanding our energy-saving design on the products and developing green energy products and services. For example the products acquired green mark and energy label, LED parts and products, solar energy wafers, film/single/multi crystal solar energy module, raw materials for C-LiFePO4 batteries and energy saving system. With both operation approach and product/service approach, we can reduce greenhouse gas emission and thus lower the impact to the environment. Looking towards the future, we will continue to carry on our founder’s operational ideas of “integrity, honesty, industry and frugality” to provide high quality products and services. We will take corporate social responsibility into the operation and achieve the goal of sustainability in the near future. Supporting traditional art and innovation, the Company invited paper carving artists for five consecutive years to design Tatung Boy small lanterns whose design was based upon the animals representing Chinese zodiac. Supporting the inheritance and innovation of folk art, the Company invited local lantern artists to create Tatung Boy lanterns which were exhibited in the 2015 Taiwan Lantern Festival in Taichung City and Taipei Lantern Festival. In the hope of cultivating positive thinking for those disadvantaged teenagers, the Company invited 400 underprivileged children from 19 charitable groups to participate in the 6th Tatung Charity Soccer Summer Camp hoping to plant seeds of teamwork spirit and sportsmanship in children’s mind through practice of sports. To encourage originality of creation, the Company invited performing art group for three consecutive years to work together producing a children drama, "Tatung Boy Loves the Earth", and toured at the elementary schools around the island. By infusing in the ideas of saving energy, health and environmental protection in the story, children can learn good habits from the play. Supporting the development of local commercial district, Tatung Boy participated in the 2015 Happy Halloween in Tianmu organized by the Tianmu Marketplace Development Association. To help to promote community construction as well as encourage the mass public’s interest in artistic and cultural activities, Tatung Boy participated in the 2015 New Taipei City International Environmental Arts Festival. Participating in the energy-saving movement, the Company took part in the smart energy-saving programme by the Taoyuan City Government. The Company raised a fund of NT$12 million for the victims of Kaohsiung gas explosion disaster to help the reconstruction in disastrous areas. Inviting employees to support 2014 tax Campaign, “Donating Invoice to help garlic farmers”, organized by Revenue Service Bureau of Yunlin County. A total amount of 3755 invoices were collected in exchange of 751 Taiwan cattys of garlic, through which campaign, local garlic farmers and the disadvantaged social groups were all made beneficiaries. Holding 5 consecutive years of Tatung Charity Soccer Summer Camp in Taipei City, Taoyuan County,Taichung, Kaohsiung, Pingtung County and Hualian County. We had invited 300 children from 13 social Groups around Taiwan to join the camps. Some Tatung Soccer Team players coached those children with soccer rules and skills. Also,they learned communication skills and teamwork in order to face every single challenge with more confidence in their daily life. Supporting Taiwanese Performing arts groups by producing the charity children drama“Tatung Baby Doll Loves the Earth”at 8 public elementary schools in Taipei City, New Taipei City, Taoyuan County, Miaoli County, Hsinchu County,Nantou County and Yilan County. This charity performance introduced energy saving, health and environmental Protection in the scenario for children to develope some good habits from childhood. Tatung Baby Doll, Goodwill Ambassdor, articipated in the annual charity sports event- Taipei Fubon Marathon to cheer up for the runners with great support. To support Tianmu Marketplace Development Association” 2014 Halloween Party”produced 1000 Halloween “Pumpkin” specials, free of charge, for. It was a response to the Taipei commercial district development and Community Empowerment. Tatung Baby Doll participated the New Taipei City Tamsui Environmental Art Festival and brought laughter to the public with passionate dancing parade, enhancing the arts events participation and promoting the New Taipei City community empowerment. Tatung Baby Doll, goodwill ambassador, was invited to the Taipei Street-Shopping Festival organized by the Department of Development Taipei City Government and the Small & Medium Enterprise Administration Ministry of Economic Affairs to show the local specialty promotion events and support the development of local special industries. Tatung Baby Doll, goodwill ambassador, participated the 2015 Taipei Fringe Festival, the only unlimited and no screening creation platform, organized by the Department of Cultural Affairs of Taipei City Government and Taipei Culture Foundation, showing support the Taiwanese performing arts group with action. In the name of the Tatung 96 Baseball Fun Sports Day, we had invited employees and their families to watch the game between the Uni-Lion and Brother-Elephants showing appreciation for employees’hard work and efforts in the past year, hoping to increase the employee morale and improve the quality of work. Inviting more than 450 underprivileged children from 14 charitable foundations to participate in Tatung Charity Soccer Summer Camp held in Taipei City, New Taipei City, Taoyuan County, Hsinchu County, and Miaoli County where children were taught skill and knowledge of soccer in the field by the Company’s professional team. Tatung organizes this charitable event annually with an intention to inspire the disadvantaged children with sport playing hoping to help them to cultivate spirit of team work and sportsmanship. Donating rice cookers to the Institute for the Blind of Taiwan to help people with visual disability to learn cooking skill so that they are able to take care of their daily life. Donating 12,500 cups of instant rice porridge to the Genesis Social Welfare Foundation for the old people who live alone with convenient nutritious diet supplements. As an attempt to improve the quality of life for the underprivileged living in children’s homes, Tatung donated 1,000 units of energysaving electric fans to 79 social welfare organizations nationwide. These energy-saving cooling appliances help to bring down the heat in the rooms thus also help to calm children’s emotion reducing violent behaviour from happening. To help physical and intellectual disabled people to develop confidence and sense of achievement in their jobs, Tatung 3C cooperated with Syinlu Social Welfare Foundation to sell 5,000 gift boxes of egg roll, made by people with physical and developmental retardation, in 240 stores nationwide. All proceeds were donated to Syinlu Social Welfare Foundation. Fundraising for disadvantaged children’s lunch box and all proceeds were donated to the Child Welfare League Foundation. To support Autism Society Taiwan for its job training and community service programmes, Tatung invited members of Autism Society Taiwan to the Company’s staff restaurant to sell their handmade steamed bread. The event was well-received by the Company’s personnel as the goods were quickly sold out. Tatung boy, the ambassador of Tatung Company, participated in summer activities by the Taipei Expo Foundation in Taipei EXPO Park to promote the development of MICE (Meeting, Incentives, Conventions, and Exhibitions) industry in Taiwan. To support local marketplace development and community empowerment in Taipei City, Tatung sponsored Tianmu Marketplace Development Association with 1,000 pumpkin buckets for Tianmu district’s Halloween celebration --- ” 2013 Halloween Party”. When it comes to support performing arts in Taiwan, Tatung takes its initiative in collaborating with IfKids Theatre to produce “Tatung Boy Loves the Earth” --- a children’s drama. The drama was showcased to nearly 6,000 students of 3 primary schools in Greater Taipei. Concepts of energy saving, healthy living, and environmental protection were infused in the plot of the play to educate youngsters for correct daily practice. To celebrate its 95th anniversary of establishment, Tatung held an open-air charitable concert in Pinxi inviting Taipei Opera Chorus and IfKids Theatre to perform for the general public. The people drawn by the activity also helped to contribute to Pinxi’s local economy. Providing Tatung home appliance products for the filming of “Rhythm of the Rain” to support Taiwan’s cultural and creative industry. Participating in “Taiwan Excellence Cares”, an annual charity event by the Bureau of Foreign Trade, Tatung sponsored award winning rice cookers to deliver message of love and caring. Long-term commitment to help finding missing children by posting search posters in 240 stores of Tatung 3C nationwide while setting up hyperlink for a easy access to the Missing Children Data Resource Centre of Child Welfare League Foundation. Blood donation in every summer and winter holidays ---112 bags of blood were donated in 2013. Setting up receipt donation boxes in the complex for the benefit of Genesis social welfare foundation and Noordhoff Craniofacial foundation. Donating rice cookers to the Institute for the Blind of Taiwan to help people with visual disability to learn cooking skills in the hope of gaining back their abilities to stand on their own feet . Assisting St. Theresa Opportunity Center in Tainan to upgrade its laundry equipment. Long-term commitment to help finding missing children by posting search posters in nearly 250 stores of Tatung 3C nationwide while enabling hyperlinks to the Missing Children Data Resource Centre of Child Welfare League Foundation. Participating in a charitable programme by the Ministry of Interior to purchase moon cakes made by people with physical / mental defectiveness for 400 underprivileged children for Mid-Autumn Festival. Inviting more than 400 underprivileged children from Taipei Orphan Welfare Foundation to participate in Tatung Charity Soccer Summer Camp held in Taipei City, Taichung City, ChiaYi County, Kaohsiung City, Ping Tung County, and Hualien City where children were taught skills and knowledge of football in the field by the Company’s professional team --- a charitable event held annually by the Company with an intention to inspire the disadvantaged children with sport playing to cultivate spirit of team cooperation and sportsmanship. Tatung Boy, the brand ambassador, joined the street parade for the opening of Taipei Frank Festival to support artists for their creation and passion for life making art activities friendly to the general public. Providing series of classic animation adverts of Tatung Boy and materials for animation DIY classes to the Cultural Affairs Department of New Taipei City Government for FZ 15’s animation exhibition where activities were created to encourage a closer parent-child relationship. Promoting characters of Taiwan’s indigenous culture with creative touch by arranging Tatung Boy in the dance with Techno Prince Nezha debuted in 2012 Yilan International Children’s Folklore & Folkgame Festival . Holding Christmas charity bazaar for the benefit of United Way Taiwan . Blood donation in every summer and winter holidays --- 351 bags of blood were donated in 2012. Donated two special models of Tatung rice cookers, designer limited edition for 50th anniversary & iF award winning edition, to Taiwan Design Centre and National Science and Technology Museum for permanent display to record the achievements in the history of industrial design in Taiwan. 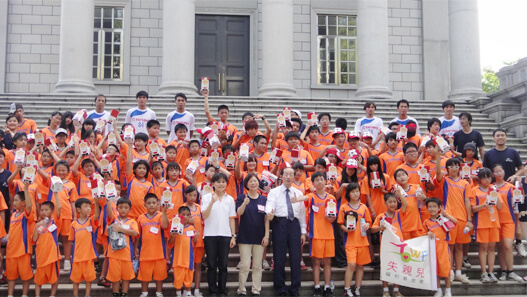 Invited 400 children from Taiwan Fund for Children and Families(TFCF) & Zhi-Shan Foundation TAIWAN to participate in “Tatung Charity Soccer Summer Camp”. The camp was held respectively in Taipei City, New Taipei City, Taichung City, Changhua County, and Taitung County where children were accompanied by a team of the Company’s qualified coach to physically play on the field after tutorial sessions. The Company hoped, through actual practice, children could not only experience the fun and be guided into liking outdoor activities but, more importantly, to learn the spirit of teamwork and sportsmanship. Sponsored Children’s Performing Art Festival in New Taipei City to help children learn to appreciate aesthetic in various forms by local and international performing groups while nurturing children’s curious souls with creativity and love. To raise general public’s awareness of the schooling issue amongst the disadvantaged, the Company organized an open concert inviting entertainers, pop music performers, and classical music artists to jointly perform in the amphitheatre of Daan Park to raise funds for orphans and children with single parent. The Company’s fundraising campaign for the underprivileged children also included constructing a website as a platform to disseminate information as well as enable voluntary public donations at any time during the giving campaign. 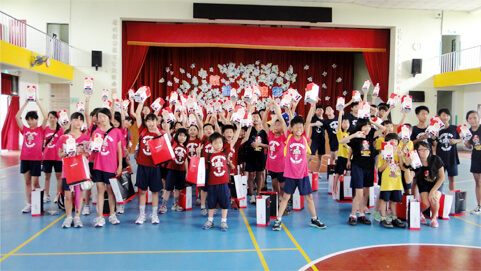 All proceeds of NT$856,436 was donated to Taipei Orphan Welfare Foundation. Sponsored flat panel displays equipped with state-of-the-art technologies for the exhibition of “The Stories of the Historic Stores in Taipei” by the Department of Cultural Affairs of Taipei City Government. To promote proper outdoor activities, Tatung Boy participated in “2011 Fubon Taipei Marathon” as the ambassador to the game. As a responsible corporate citizen, the Company was chosen by Elim Young, a charitable organization for school drop-outs, to look after hundreds of green plants planted by school drop-outs. The Company was honoured and delighted to be the proud caretaker of the gift of love as it could recognize the school drop-outs’ achievement for their learnt skills as well as encourage them to further develop into professionals. A handsome number of our employees later became the happy guardian angels for the plants they adopted. To support cultural events, Tatung Boy was made an ambassador to participate in the Christmas parade by New Taipei City Government. The joyful appearance of Tatung Boy attracted many spectators to take part in the street event. Highly echoed by the employees within the Group, 171 packs of fresh blood were collected in our blood donation campaigns during summer and winter vacations. Participated in the “Million People Million Trees” event with HIMA foundation which called on people from all walks islandwide to save the earth by planting trees with endangered native plants in Taiwan. The Company sponsored the event and was the care taker of a forest land of 500 trees. Cooperated with Taipei Philharmonic Foundation for Culture and Education to hold ”Aboriginal’s Dialogue with Nature” concert, in which Master Kimbo Hu, Father of Taiwanese folk music as well as the pioneer for aboriginal movement, gave his rare performance for the promotion of young aboriginal performing groups. As a Taiwan-based company, it is our obligation to treasure and promote art and culture that are indigenous to Taiwan. 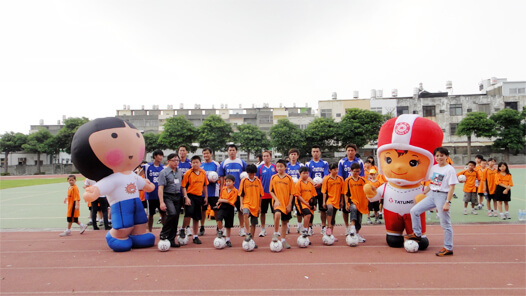 In an effort to help the underprivileged children to cultivate a proper and healthy hobby , the Company invited 200 students from children’s homes including HongHua Children's Orphanage, Bethel Orphanage, Tihwei Orphanage, and Southern Taipei Family Helper Project of Taiwan Fund for Children and Families to experience the joy of playing football. 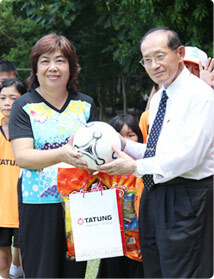 The Company pulled resources from within to form a football coach team for “Tatung Charity Soccer Summer Camp” project. Providing all necessities for football playing, our coach team travelled to each children’s home to introduce international football game and teach the children proper skills of football. The children were also divided into teams to happily experience the game on the field. As a promoter of local young talents and performing art, Tatung supported the making of Chinese musical play, “The Golden Decade of Campus Folk Songs “, by Taipei Philharmonic Theatre. In view of the social climate under today’s modern society where juvenile crime becomes a worrying issue, the Company also invited the families and children from Good Shepherd Social Welfare Services to the play hoping to encourage the underprivileged children and the troubled families through the manifestation of a positive attitude towards life that is full of passion, enthusiasm, inspiration, and love. To help the residence in the disaster area, Tatung supported Suao town office with canned food, instant noodle, and bottled water in the wake of Typhoon Megi’s ravage. Charity sale and book donation were held for people in need. All proceeds were donated to the Taiwan Fund for Children and Families. In response to the shortage of blood particularly in summer and winter breaks, the Company encourages its employees to be a blood donator by setting up a temporary blood donation station on site in the Company every year. In an effort to help the underprivileged children and families, Tatung invited Child Welfare League Foundation to launch the“Tatung Boy T-shirts for Hope” campaign. The campaign struck a big echo within Tatung Group’s employees and all earnings were made to the Foundation. To help the victims of typhoon Morakot, Tatung initiated a Special Service Project in which 1,000 technicians and 70 service trucks were mobilized in and around the affected areas to help handle damaged home appliance items. The employees of Tatung Group together with the staff of Tatung University and Tatung High School also donated their one-day earnings totaling to 10 million Taiwanese dollars to those in need. The Company launched “Books for Love” campaign to pool a vast selection of books from its employees for the victims of typhoon Morakot. The nearly one thousand books were then transported by the Company’s logistics team to the organizer, National Museum of Taiwan Literature. In response to the shortage of blood supply especially during summer and winter breaks, the Company encourages its employees to become a voluntary blood donator by setting up a temporary blood donation station on site in the Company every year. Shan Chih Asset Development donated 200 rice cookers to Taiwan Fund for Children and Families. Donated small home appliance products to charities such as Ping Tung Bethany Home, Syin-Lu Social Welfare Foundation, Tatung Children’s Home, Ti-Hwei Children’s Home, and Taipei Orphan Welfare Association. Inviting aboriginal and underprivileged children from charities namely Taiwan Fund for Children and Families, Hong Hua Children’s Orphanage, and Compassion International Taiwan to experience the facilities of National Taiwan Science Education Center. Assisting Bureau of Health Promotion, Department of Health, R.O.C. (Taiwan) to propagate the idea and advantage of “No Smoking in Workplaces” by taking part in its promotion film. The Company has been a model in practicing the idea of “No Smoking in Workplaces” for more than a decade.